I think I’ve written on here before about my hooligan phase. It ended when a group of us were chucking marbles at the Portsmouth goalkeeper John Milkins from the boys’ enclosure at the front of the old Grange End at Ninian Park and one (not thrown by me) hit him on the side of his head – he went down as if he was poleaxed and, on a filthy day when it was hammering down with rain, lay face down in the muddy goalmouth full of puddles. Play was stopped by the ref and Milkins received treatment before being able to carry on, but I think it’s fair to say a lesson had been learned by all of us. Actually, it had become unusual for me to be in the boys’ enclosure because, as a wannabe boot boy, I had decided my place was at the back of the Grange End, where all of the bovver boys were, and I can remember watching matches from up there for months before that meeting with Portsmouth. I should point out, that back in January it was the fiftieth anniversary of that Portsmouth game (we won 3-0 against a team which, as I remember, were right in the mix for promotion to the old First Division at the time), so hooliganism lost whatever attraction it once held for me just before my twelfth birthday. Since then I’ve been completely anti football violence and, apart from on a couple of occasions, have not come remotely close to a confrontation with opposing supporters at all. As it happens, those two brushes with opposing fans both came in matches with Chelsea and, having avoided trouble completely on my travels watching City down the years, both occurred within a short distance of Ninian Park. In fact, the first was right outside the Grandstand at our old ground before a game when a Chelsea fan, who was older and bigger than me, took a couple of swings at me, missed (he must have been pissed!) and ran off, while the second came after a game which Chelsea had won, when me and my brother were chased by a gang of their fans as we were walking to the bus station before we managed to shake them off after running a few hundred yards. So, all of the football violence (in the loosest sense of the term!) I’ve encountered in the past half a century has involved Chelsea – little wonder therefore that they are one of a very small number of clubs I have disliked throughout all of my adult life. Truth be told though, I was no lover of Chelsea even before those two incidents in the late seventies/early eighties. My dislike of the club extended to me supporting Leeds (another team I despise – Glasgow Rangers being the only other one really) when they faced the Londoners in the 1970 FA Cup Final. Quite what Chelsea did to upset me back in those days when I’d never ever seen them play City I’m not sure – they were one of the best sides in the country in the years before and after my time throwing alleys at Portsmouth keepers and had exciting attacking players like Peter Osgood and Charlie Cooke in their team. 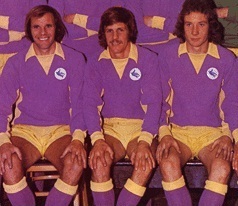 They also had a dark edge to their game mind, in that they weren’t backward in coming forward if things got physical,with the appropriately nicknamed Ron “Chopper” Harris well to the fore – they weren’t in the Leeds class when it came to the dirty stuff and gamesmanship though and yet I still wanted “Don Readies” side to beat them in that FA Cup Final, strange that. With all of that baggage, you will not be surprised to learn that I won’t be wanting Chelsea to win the Premier League any time soon. Yet, in truth, the football they are playing must make them one of the most watchable sides in the country if you are a neutral observer (which I tend to be in any match not involving us). At a time when the approach to playing the game which places a premium on retaining the football is coming under pressure from an, essentially, negative philosophy which says “let them have the ball, we’ll just sit back, keep our shape and hope to catch them on the break by captialising on their mistakes”, Chelsea play a version of the possession game which can hardly be called possession for the sake of possession. The version of the game which is derided as being “tippy tappy” these days does not apply to Chelsea – rather than be content to go backwards or sideways to no great purpose like too many sides which play football “the right way” are, they always look to pass the ball forward under new manager Maurizio Sarri. Of course, this type of passing has to carry a greater risk of handing possession over to your opponents than the safer mode favoured by others, but the fact that Chelsea have still been able to rack up some very impressive possession figures so far this season is a testimony to both the quality of their passing and their efficiency in winning the ball back quickly if it is lost. Chelsea stand at the top of the Premier League this morning with a one hundred per cent winning record. Arsenal are among the teams who have been beaten by Sarri’s team this season, but with the Gunners hardly being seen as Champions League candidates this season, let alone possible Premier League Champions, and their other victims being Huddersfield, Newcastle and Bournemouth, one of the doubts about their title credentials being expressed was along the lines of you’ve not played any one of any consequence yet. Now, I take no pleasure in saying this, but the truth is that this argument still applies after their win over City at Stamford Bridge yesterday by the rather flattering margin of 4-1, because the truth as I see it is that, if you are measuring the quality of a team by a combination of on field resources and football budget, we are going to be underdogs in all of our games this season. Consequently, wins over Cardiff are not going to make people change their assessment of a side, but defeat by Cardiff might well do. 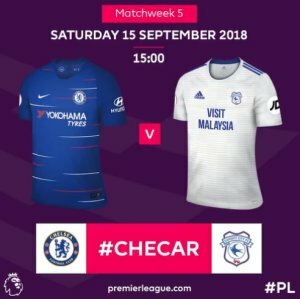 For a short time yesterday, the possibility that opinions on Chelsea would have to be revised existed as City, fielding the same team which started against Arsenal, took a lead that they probably deserved on the balance of play when their centrebacks combined to good effect as Sean Morrison nodded a Joe Ralls free kick across goal for Sol Bamba to finish adroitly on the far post. It’s often forgotten that we went 1-0 up in both of our games with Chelsea in our previous season in the Premier League, only to be overtaken and beaten by our opponents on each occasion and there were obvious similarities with the match at Stamford Bridge five years ago this time as Chelsea recovered from the jolt of conceding to finish up 4-1 winners. That afternoon, the home side were helped on their way to victory by referee Anthony Taylor who allowed Samuel Eto’o to kick away a ball, which keeper David Marshall had under his control by the laws of the game, for Eden Hazard to equalise. This time Hazard played a prominent role in Chelsea’s recovery by netting a hat trick amid claims that he is now a serious candidate for the title of best player in the world. Until this summer, I would never have thought that because, having seen his performances in losing causes for Belgium against Wales on a couple of occasions, I thought he had a tendency to go missing when things got tough for him and his team, but his immense performances against Brazil and then France in the latter stages of the World Cup made me reassess that opinion. Although Neil Warnock was of the view that Joe Bennett should have stopped things getting to the stage where there was a shot on our goal, Hazard’s finish from the corner of the penalty area for Chelsea’s equaliser just as an under pressure City side were beginning to think they could get to half time with their lead intact was pure quality. The Belgian’s second a minute before the break was much more straightforward as Bamba deflected in his close range effort after Giroud’s touch once City’s right hand side had been opened up. Although there had been little to suggest City had an equaliser in them going into the last ten minutes, the suspicion that Chelsea’s approach will always give you a chance to get a them defensively (for example, besides the goal, Bobby Decordova-Reid shot just wide and Sean Morrison planted another presentable chance for his first Premier League goal for us over the bar just after we had gone 2-1 down – Callum Paterson also headed against the post when it was 4-1) meant that a share of the points was never really beyond us until the seventy ninth minute when the otherwise impressive Bamba rashly brought down Willian for an obvious penalty which Hazard converted. Willian then scored a beauty to make it four, which was probably one more goal conceded than City deserved on an afternoon where that earlier comment I made about our lack of onfield resources was really emphasised. I read comments after the match about us not passing the ball well in the second half. For me the answer to that is simple, we have only started to sometimes pass the ball in the manner you would expect from a top flight club because of the arrival of loan signings Harry Arter and Victor Camarasa. If one of those is absent for any time, as Arter was after half time yesterday, then our passing suffers. Arter, who lost his booking a game record probably as a consequence of him not being there after the break, was not at his best while he was on the pitch, but our manager stated that he was suffering from a stomach bug which meant he could not carry on. Now, I would say that at every other Premier League side there would have been a like for like replacement on the bench, but there wasn’t in our case – we coped by moving Camarasa infield and bringing on Jazz Richards to play on the right, but I couldn’t help but wonder when are we likely to see Aron Gunnarsson available again for first team selection? Next weekend it will be a year since I would say we have had a completely free from injury Gunnarsson available for us. On 23 September 2017, Gunnarsson went off late in the 2-1 win at Sunderland and since then has always been injured or coming back from an injury. His performances late last season when he started in seven consecutive games had many thinking he would not be up to playing at Premier League level, but it would he good to get the chance to learn whether they were right or not – as it is, after shaking off yet another injury to captain Iceland in the World Cup, Gunnarsson, from memory, did not even feature in our pre season programme and has not been seen in a first team squad since the competitive stuff started. For me, our best football this season has come when Arter, Ralls and Camarasa were there to give us a solid midfield base of players capable of giving a decent account of themselves in the Premier League, but once one or more of them is missing, we end up with a bodge job in the middle of the park with full backs playing on the wing or, as at Bournemouth, with Bamba and Paterson in there. Just as against Arsenal, Danny Ward did enough yesterday to justify him being given more time to make the target man role his own, but what happens if and when he cannot play? Sadly, Kenneth Zohore, who I feel has the pace, power and movement to cause Premier League centrebacks real problems, has only confirmed suspicions which, to be honest, I first had watching the Real Betis friendly, that he has not yet turned up this season and I thought it was significant that Warnock turned to Gary Madine rather than him when Ward was substituted. It was unfortunate for Madine that we conceded twice within minutes of him coming on and so most of the time he was on the pitch he was a part of a team which knew it was going to lose, but I think his lack of movement really works against him at this level. Indeed, watching the way Paterson was able to direct his header on to the post from an awkward position had me wondering whether he would be a better striking option than Zohore or Madine at the moment? All in all, it was the worst weekend of the season so far for City because Lee Tomlin was sent off while playing for the Development team on Friday as they lost 3-0 at Coventry to follow on from a 2-0 loss at Nottingham Forest last Monday. With Neil Warnock saying that any youngster who breaks into the first team this season is more likely to come from the Under 18s, I do find myself questioning the relevance of a Development team at Cardiff at the moment. As for the Under 18s, they lost their 100 per cent winning record when a first half goal consigned them to a 1-0 loss at Bristol City yesterday. Five of the members of the usual Academy team were involved in a couple of Wales Under 19 internationals against the Republic of Ireland last week with one being won 1-0 and the other lost 2-0 – four City players started in the game which was won, with the goal being scored by Sion Spence who did not feature for the Under 18s against Bristol. Spence was probably injured or, less likely, involved with the Development team on Friday, but, given our lack of central midfield options, I wouldn’t say it was beyond the realms of possibility that injury doubts may have meant that he was part of the senior team party which traveled to London for the Chelsea game. Certainly it seems to me that, in Gunnarsson’s continued absence, Neil Warnock would have to look outside the twenty five names in his Premier League squad if he was looking for a specialist in the middle of the park. I should also add that the short term goal of recompensing those who paid this summer’s web hosting bill has been achieved and I was able to give those involved a cheque for the full amount recently which came wholly from the donations of patrons – however, there are still the medium and long term goals I outlined on Patreon page.